Mumbling or unclear speech is something that we come across most frequently with school aged children. They normally have all the expected speech sounds, but when chatting are just harder to understand. Some may speak quietly, others may speak too quickly, but overall they are just mumbling! 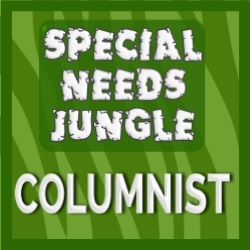 This reduced intelligibility can stop children participating in class and socialising – so what can we do to help? 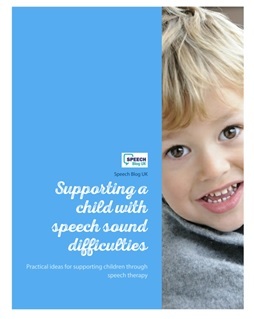 Firstly, we need to make the child aware of how their talking sounds. We can’t expect them to correct anything if they don’t realise they are hard to understand. An easy way to do this is to record them speaking. Now that all our phones and tablets record, this is nice and straight forward (please ensure you have parental permission as appropriate for your employer or your terms and conditions!). Encourage your child to listen to themselves talking and see how they would describe their speech. You may need to introduce some ways to describe their speech – have they heard of mumbling? Do they think they are slurring or speaking too fast? Find words that your child understands. Please be careful not to sound really negative about their talking – we don’t want to stop them talking altogether! But maybe point out that a particular sentence was tricky to hear all the words. If your child is finding it hard to hear or identify that they are mumbling, you can play a game where you say/ read sentences. Say some clearly and others mumbled. Encourage your child to identify which is which. 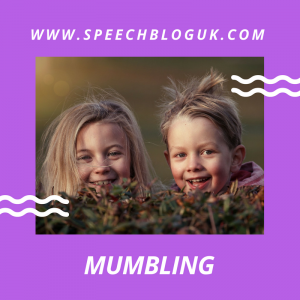 If you need more ideas, Jenna has written a great post here, which has video clips to describe and show what mumbling is. You can watch these with your child. The next step is to get your child to say or read sentences. You can have fun with this! You can introduce the idea of speaking slowly and quickly. Encourage your child to say a sentence really quickly and then really slowly. You often find that when children slow down, their speech becomes clearer. You can praise them and talk about how clear their speech sounds when they slow down. Some children may need to be encouraged to talk a little more loudly or with more confidence. Sometimes for these children you might need to practise shouting or projecting your voice to the back of a room. Play around with it and see what works best for your child. Once your child has mastered speaking clearly when they are concentrating in a specific task, the next step is to help your child generalise this clear speech to everyday tasks. You may need to talk about how important it is to speak clearly – that it will help in class or when talking on the phone. We all want other people to understand us. If you are working with an older child you maybe able to agree on which activities they are going to try and speak more clearly in and then get them to feedback to you afterwards about how it went. Was it easy to speak clearly? Did it help? What will they do next time?